There’s something exciting about seeing a band that’s riding its first really big surge of popularity. 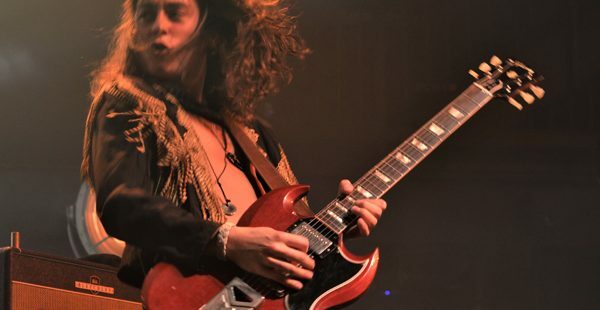 The enthusiasm of the initial breakout and the buzz of expectation that even bigger things are coming down the road combine, fueling the energy level that symbolized Greta Van Fleet’s tour stop last week at Rams Head Live. Following opening act Dorothy, Greta Van Fleet took the stage with a close to two-hour statement on how to take a late 70s classic rock experience and reinvent it with a modern sensibility and sound. The music is pure rock and roll, blues heavy and interlaced with some frantic guitar work among the rhythms. Opening with “Highway Tune,” the band’s first single which reached No. 1 on Billboard’s Rock Radio charts, and finishing with the latest single “Safari Song,” the set featured six songs from their latest release “From The Fires,” a cover of Howlin’ Wolf’s “Evil,” and five as yet unreleased songs, some of which we could see on the band’s next release. 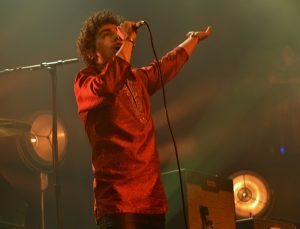 The show had several nods to performance elements reminiscent of a 70s rock vibe, from tambourine-shaking singer Josh Kiszka tossing flowers to the crowd when taking the stage, to Jake Kiszka cutting loose with a behind the back guitar solo, to bassist Sam Kiszka sliding stage right to double up on keyboards for some of the the more trippy musical moments ala Led Zeppelin’s John Paul Jones. The crowd remained fully engaged throughout the show, packed in tight and eating it up all night. Fans ranged from young teens catching one of their first concerts to 50-something veterans who grew up on the musical style GVF draws so much inspiration from. The show marked the band’s third trip to Baltimore in the past year. 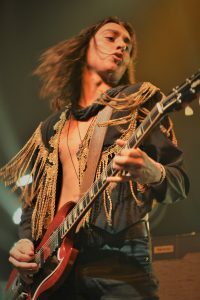 “The very first time we had ever toured out, we went out with a British band, The Struts, and we went to the Rams Head, it was the first tour and Sam and Danny Wagner had taken weeks off School for,” Jake Kiszka said of their first stop here last May. They returned in October for a show at the Ottobar in Charles Village. Jake Kiszka and Greta Van Fleet played for nearly two hours last week. “Out of all those larger cities that we’ve been to, LA, New York, Chicago, Nashville, things like that, it just seems like there’s kind of groove with a smaller town feel, and Baltimore has that, and we really appreciate that and like Baltimore for that, and so yeah, we’ll keep coming back,” he added. This tour’s Baltimore show sold out very quickly, just like the rest of the band’s tour stops, a reflection on just how popular these three Michigan brothers and Wagner have come into the collective musical consciousness. It’s not just the rank and file fans finding something special about Greta Van Fleet. In March the band received a personal invitation from rock icon Elton John to perform at his annual Oscar Viewing Party. Sir Elton performed his classic “Saturday Night’s Alright for Fighting” and GVF’s “You’re the One” with the band. When asked about what it’s like working in a band with his two siblings, Jake Kiszka shared a bit about how the teenage brothers brawled and bonded on the way to where they are now. With the high demand for tickets to the Rams Head Live show, prices on the secondary ticket markets got pretty steep, with many going for two to three times face value. They came up with a plan to counteract it by setting up a second, box office only sale at several of the venues as the shows grow closer. Greta Van Fleet returns to the area for two Washington D.C. shows July 21-22 at the 9:30 Club and The Anthem, respectively.